Our market research is also available via Tradingview & YouTube. Would you like to experience first-hand interaction with other like-minded traders and the author? Join our discord room, a place for all to hang out and get to know each other while trading the markets. For big institutions and traders with a need to fill large orders, finding pockets of enough liquidity is absolutely essential. 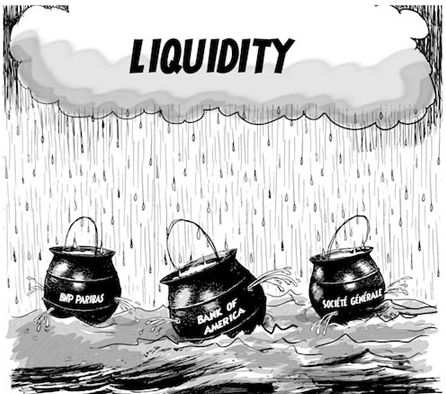 A market’s liquidity has a big impact on how volatile the market’s prices are. When these big players take positions in the market, they obviously aim to be filed at the best possible price. However, given the size of their positions, they need to find enough counter-forces to fill their orders, and here is the key, with the minimal amount of slippage. If a big player were to enter the market at an area of low liquidity, the volatility it would create would have a negative impact on the average price it gets. Lower liquidity usually results in a more volatile market and cause prices to change drastically; Alternatively, if the same trader were to enter a trade at an area of much higher liquidity, it usually creates a less volatile market in which prices don’t fluctuate as drastically, therefore ensuring a better average price for the entire position aimed to enter. Other nuances one must be aware of when trading levels of liquidity include factoring in the time. If the separation between the creation of the liquidity area and the first retest comes after an excessive number of days/weeks (depending n the timeframe you trade), the level may not hold the same weight as it used to as the market context evolves and orders get pulled. At the same time, if you find two or more liquidity levels nearby — clustering of multiple levels of interest — , market participants will tend to place their stop loss orders at the most extreme level, so be aware of that. The information on this blog is not intended to be an inducement, offer or solicitation to anyone outside of Australia. Global Prime Pty Ltd, ABN 74 146 086 017, (Global Prime) holds an Australian Financial Services Licence (AFSL) to carry on financial services business in Australia, limited to the financial services covered by its AFSL no.385620. Any Information or advice contained on this blog is general in nature and has been prepared without taking into account your objectives, financial situation or needs. Before acting on any information or advice on this blog, you should consider the appropriateness of it (and any relevant product) having regard to your circumstances and strongly recommend you to seek independent financial advice. Please read our Financial Services Guide and current offer document which is available to be downloaded from www.globalprime.com.au or hard copies may be sent by contacting us on the details provided on this website. All financial products involve risk and you should ensure you understand the risks involved as certain financial products may not be suitable to everyone. Trading in margin foreign exchange and derivatives carries a high level of risk and you may incur a loss that is far greater than the amount you invested. Past performance of any product described on this website is not a reliable indication of future performance.